Walter & Phillip Hoffman "2006 Surf Culture"
If there’s any doubt that surfing runs through blood lines, then check out the Hoffman’s. Walter and Phillip (aka “Flippy”) were two of California’s first big-wave pioneers. Walter’s daughter Joyce Hoffman was one of the best known female surfers in the late 1960’s and his other daughter Dibi married Herbie Fletcher and soon Walter became the grandfather to aerial masters Christian and Nathan Fletcher. Flippy’s son, Marty Hoffman competed in the Quiksilver in Memory of Eddie Aikau big wave contest at Waimea Bay in 1990. Of course, this saltwater lineage had to begin somewhere. Walter and Flippy’s parents opened a textile business in 1924, which the brothers eventually took over. This ultimately engrained a place in Southern California for the new, burgeoning surf culture to blossom. Since Walter and Flippy had conquered numerous big wave breaks by the late‘50’s on the North Shore of Oahu, they soon realized they could embrace what they love and make a living while doing it. Both Hoffman brothers were born in Glendale, California, Phillip in 1930 and Walter in 1931. They grew up surfing San Onofre as well as the highly popular Malibu. As the classic story goes, Walter was enlisted in the Navy at Pearl Harbor and was fortunate enough to be exposed to Hawaii’s more serious surf. He soon sent video footage back to Flippy, who immediately booked a trip out there and, along with shaper Bob Simmons, was the first to rent a house at Sunset Point on the North Shore. Both brothers were among the first crew of renegades to venture to a few of the North Shore’s outer reefs, nearly three-quarters of a mile out to sea. Walter also experimented with new surfboard production methods and passed on much of his knowledge to Hobie Alter. By the late 1950’s the Hoffman brothers were running the family business Hoffman California Fabrics. A great part of our modern surf industry was built from Hoffman textiles by supplying fabrics to brands such as Billabong and Quiksilver. Neither brother was too keen on competitive surfing, although in 1995 Walter received the Surf Industry Manufacturers Association Waterman Achievement Award for his contributions to surfing as a whole. 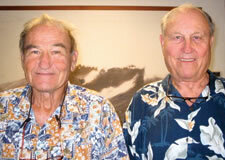 It’s safe to say that without this dynamic duo, the surf industry might not be where it is today.